Laos is a landlocked country, bordered by China, Burma, Việt Nam, Thailand and Cambodia. It covers 235,000 square kilometes (slightly larger than Great Britain and Utah), with 70 percent mountain, highland and plateaus. The current capitol of Laos is Vientiane. 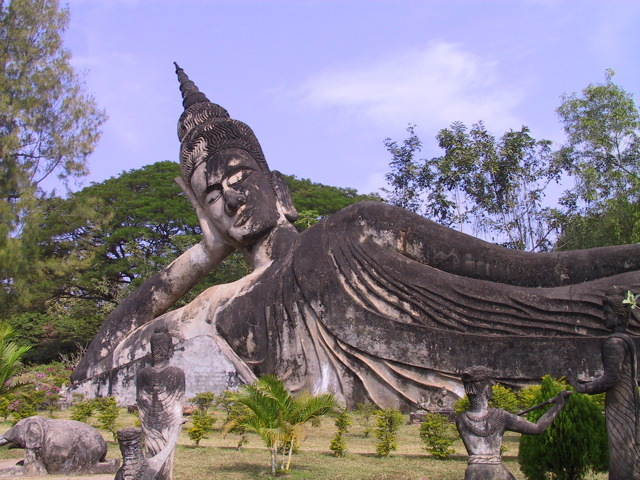 Laos has 16 provinces and two UN World Heritage sites: The city of Luang Prabang and the region of Champassak. With a population of 6 million people, modern Laos has its roots in the ancient Lao kingdom of Lan Xang, established in the 14th century. The Franco-Siamese Treaty of 1907 defined the current Lao border with Thailand. In 1975, the Pathet Lao took control of the government ending a six-century-old monarchy and instituting a socialist regime. A gradual return to private enterprise and the liberalization of foreign investment laws began in 1988. Laos became a member of ASEAN in 1997. It is one of the most heavily-bombed nations in the world in the 20th century. Laos has a literacy rate of approximately 68%. In the United States there are approximately 200,000 Lao with the largest populations residing in California, Texas, and Minnesota. Minnesota has the 3rd largest Lao refugee population in the US with 25,000 residents. In Minnesota, 70% live in Hennepin County, particularly North Minneapolis. Statistics indicate there are still many gains to be achieved in education, and the arts with many members of the community expressing concerns regarding the preservation and transmission of traditional culture. Discussions of Lao Literature is typically broken down into 4 periods: Early Lao literature, Lao literature during Lan Xang, Lao literature during the French colonial period, Lao literature from 1953-1975 and modern Lao literature since 1975, which includes literature from expatriate communities around the world, including populations in the United States, Canada, Australia, France, Thailand and other countries. One of the major literary movements among the Lao in the United States was Satjadham, formed on April 11, 1995. It was conceived as a literary project which will introduce a new chapter in Lao literature. Its stated purpose is “to contribute to the wealth of Lao literature. In addition, this project sought to introduce new and different perspectives from the viewpoints of overseas Lao. Between 1996 to 2002, SatJaDham held 7 conferences in cities such as Fresno, San Diego and Richmond, Seattle, Minneapolis, Elgin and Washington D.C. A gathering of Lao writers has not been held in 7 years, despite significant literary and artistic achievements within the Lao community including the publication of several books, special projects and the release of an Oscar-nominated film. With the advent of social networking technology and advances in the Internet, the Lao community has seen a tumultuous arrival and departure of several magazines, blogs, websites and other resources to cultivate vibrant cultural discussions.